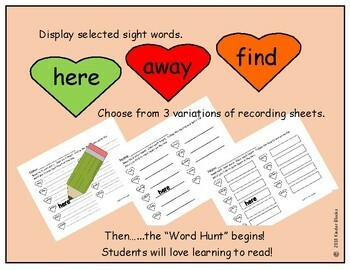 This is a fun color word and sight word activity that can be used for Valentine’s Day or any other day. The words used are from the Pre-Primer word list. 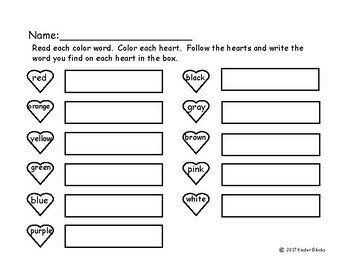 To prepare this activity, print the large hearts in color or use the white hearts to copy to colored paper. Cut the hearts out and mount around your classroom. 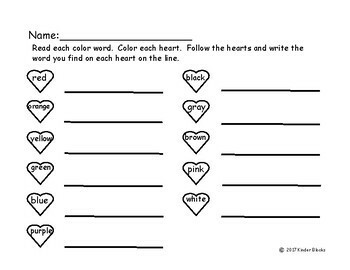 Using the recording sheet which I have provided, have your students read the color word on each heart (on the recording sheet) and then color the heart the same color. The students’ mission is to look around the classroom for each colored heart. As they find the hearts, they will find a sight word on each heart. Using the recording sheet, they then write the sight word in the rectangle or space (or on the line) next to the same colored heart. The goal is for the student to complete the recording sheet. 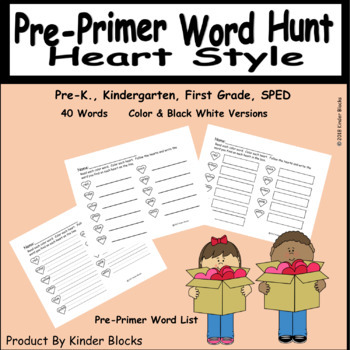 I have included three different recording sheets, as well as, a plain white heart so you may adapt this activity to fit the varying needs of your students. Since there are 40 pre-primer words, there will be 3-4 hearts of each color. This will create 3-4 different sets of sight words for multiple learning opportunities. I have also included a set on white hearts for copying. Thank you for downloading this activity. Please be sure to follow us and rate this download. Do you love these printables but need a different version? Click on any of the titles below to find the set you need!